Jobsheet is created to ensure a job or task can be carry out efficiently. Click on 'Item', a fuzzy search will appear to search for items. Enter a keyword to begin a search. Items that match the search criteria will be listed. Click on the respective item code to select the item. Salesman refer to the person who advise the customer to buy the item. Technicians refers to the person who setup or install the item. Department Code is optional. Refer to Add Department to setup the Department Code. To setup the Tax, refer to Add Items, Configure Tax Settings and Add Tax Configuration. Click 'Submit', the item will be added to the Jobsheet. Enter the Complete Date. Jobsheet Date will be the current date. The Reference Number and Remarks fields are optional. 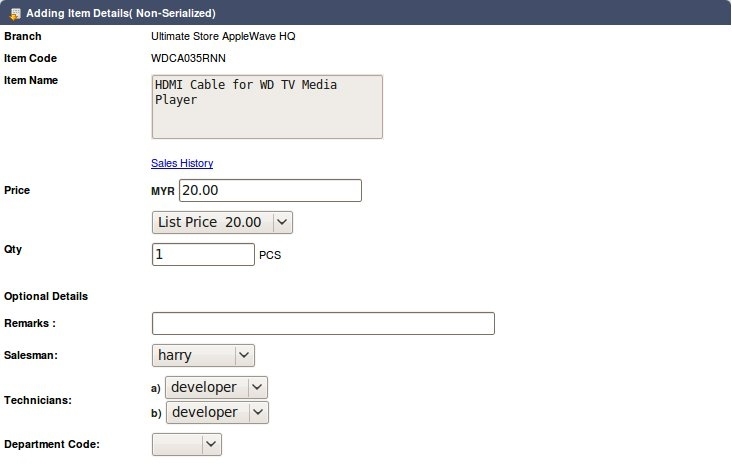 Select the Salesman from the drop down list. 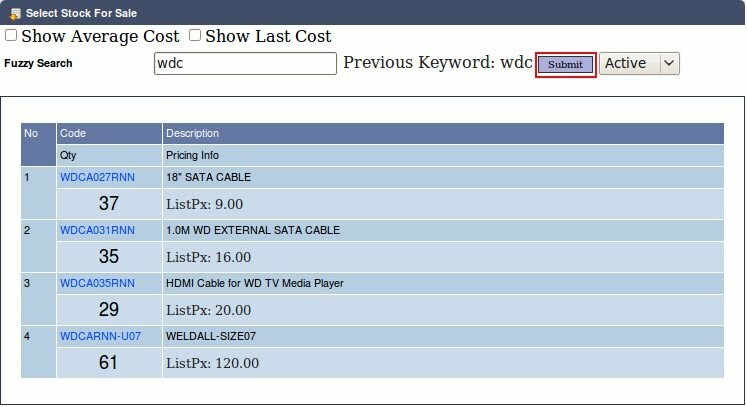 Click 'Submit' after entering the details to store the information into the system. The Items that are selected will be listed in the table below. Users can Edit or Delete the items under the Action field. Click on the 'Gross Profit' button, a table will pop up showing the unit cost of the items. Once everything have been entered and checked, click 'Save Jobsheet'. A pop up message will ask "Are you sure you want to create this jobsheet?". Click 'OK' to view or print the Jobsheet or 'Cancel' to exit.